The major gauges barely budged Thursday, but it was a big day for buyout rumors. The S&P 500 was only up about one point, but that was enough notch another all-time high. The index is slowly closing in on 2,000. The Dow Jones industrial average and the Nasdaq both ended flat as investors focused on the latest batch of earnings and deal news. SodaStream in play? Shares of SodaStream (SODA) surged on a report that said the maker of at-home soda machines is in talks to be taken private. The stock was halted briefly following a 24% spike. But the rally cooled and it ended the day 9% higher. There have been rumors that SodaStream could partner with a larger beverage company after Coca-Cola (CCE) took a significant stake in Keurig Green Mountain (GMCR), which is working on its own at-home soda machine. SodaStream did not immediately respond to a request for comment. House hunting merger? Zillow (Z) wants to buy rival real estate listing website Trulia (TRLA), according to another Bloomberg report. Sources said a deal could be announced next week. Shares of Zillow soared 15%, while Trulia's stock price surged 32%. 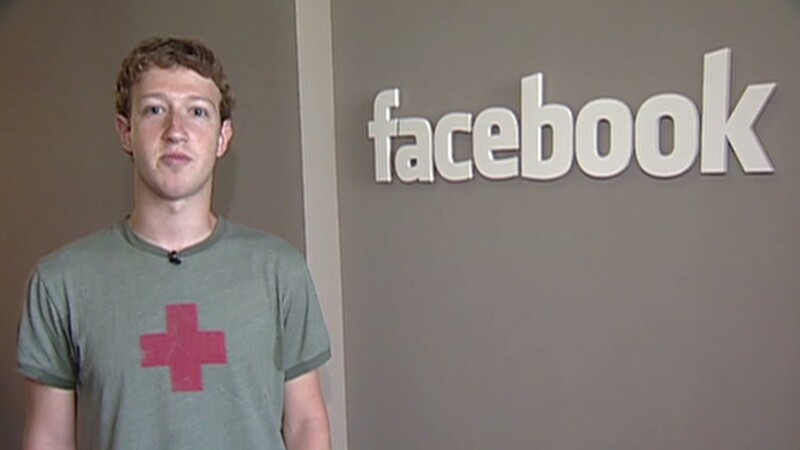 All-time high for Facebook: Facebook (FB) shares rose 5% to a record high after posting earnings that blew away expectations. Qualcomm (QCOM)shares plunged due to worries over the company's business in China. Qualcomm is being investigated under China's anti-monopoly law. The tech firm said in its quarterly report that some clients in the country are "not fully complying with their contractual obligations." AT&T (T) slipped after reporting earnings that missed expectations by a penny. Shares of Amazon (AMZN) fell in after hours trading as the online commerce giant's sales outlook underwhelmed the market. Starbucks (SBUX) reported better-than-expected earnings after the market closed. Visa (V) also topped expectations, but the stock fell in extended trading on its outlook. Pandora (P) shares fell after the online radio company's forecast also disappointed investors. Other notable movers: Caterpillar (CAT) shares fell after the construction equipment maker lowered the mid-point of its 2014 sales outlook, citing weakness in China. 3M (MMM) shares edged higher after the company reported earnings that met analysts' expectations. General Motors (GM) expects to pay between $400 million and $600 million to compensation victims of its faulty ignition switches, which have been linked to at least 13 deaths. As a result, GM will take a $1.2 billion pre-tax charge. The report comes one day after GM recalled another 718,000 vehicles. Rival automaker Ford (F) reported a quarterly pre-tax profit of $2.6 billion, including its first profit in Europe in three years. 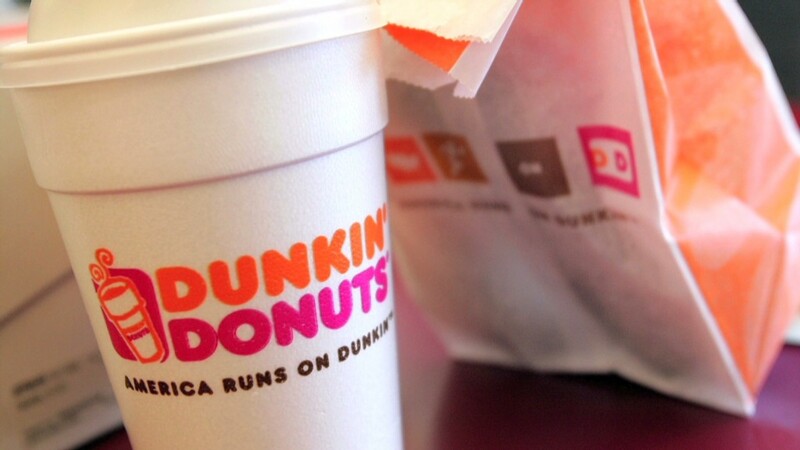 Dunkin' Donuts (DNKN) shares fell after the company missed sales forecasts, which it blamed on weakness in the U.S. and faltering Japanese sales of Baskin-Robbins ice cream. Under Armor (UA) shares jumped on better-than-expected results. United Airlines (UAL) announced a 51% surge in quarterly net income and unveiled a $1 billion share repurchase program. American Airlines (AAL) reported record profits for the second quarter. But shares of both companies ended the day down. Overall, corporate earnings for the second quarter have been strong. Of the 148 members of the S&P 500 that have reported earnings as of Wednesday, 102 have been better than expected, according to S&P Capital IQ. Stronger economy: The number of Americans filing first-time claims for unemployment benefits fell to a more than 8-year low, according to the Labor Department's weekly report. China's factories are motoring again after a dismal start to the year, with a preliminary estimate of manufacturing activity hitting an 18-month high in July. There was good news from Europe too, with a survey of purchasing managers matching a 3-year high seen in April. European markets were mainly firmer, as were most Asian markets, although Japan's Nikkei slipped. Political risks lurk: The big risk for Europe's recovery remains an escalation in the dispute with Russia over Ukraine. EU officials are due to present options for much tougher sanctions Thursday, including measures that could restrict Russia's access to European financial markets, as well as arms and energy technology. France's Technip (TKPPY) said sanctions may hurt its profit margins this year. 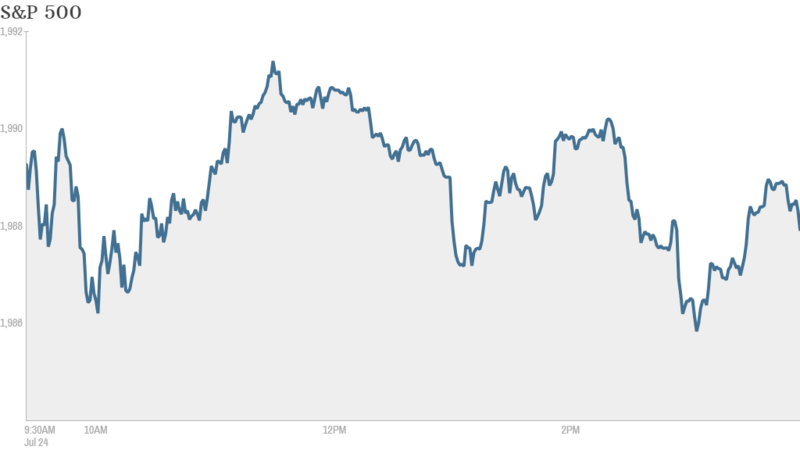 European markets were higher in afternoon trading. Asian markets ended mixed.